Robert E. Mittelstaedt, Jr. identifies the common factors beneath massive failures ranging from the Titanic to Firestone Tire, Three Mile Island to "New Coke." Why did they happen? What could have prevented them? How did they spiral out of control? Drawing on these lessons, he introduces the first systematic approach to managing multiple mistakes so they don't lead to disaster. 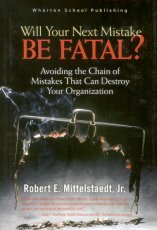 Mittelstaedt addresses errors in preparation, execution, strategy, and culture. He shows how to build internal systems that trigger loud and actionable alarms before "failure chains" accelerate beyond control. These techniques don't just apply to high-profile disasters: they're equally valuable in helping you avert failures arising from mistakes in operations, analyzing markets, understanding customers, designing and implementing strategy, or directing capital investments.